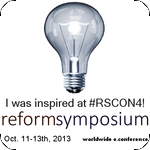 Sprite, Retweet and I have returned from The Gifted Homeschoolers Forum March Blog Hop: Homeschooling (and parenting) Gifted/2E kids into their teens and beyond and we are happily looking through the goodie bags full of resources, ideas and encouragement we collected at each blog. Retweet is feeling much more positive about continuing NEST Ed with her tweetlets when they become teenagers now! Adolesence: A Whole New World ~ Life with Intensity On growth and maturing. Adolescence isn’t so bad in our house. At least so far. This is a great post Mona – so true that many are “doing the teens” much earlier. It is so great that you are enjoying watching your son grow into adulthood. Animal Kingdom Hints for Parenting Teenagers ~ Wenda Sheard, J.D. Ph.D. Thoughts on Life & Learning Once upon a time I saw a television documentary on lions. Or tigers. Or maybe bears. The species doesn’t matter. What matters is that the animals in question had sharp claws and scary teeth designed for death. It is very valuable hearing from the student and her parents about the best and worst aspects of home education and includes very helpful advice for parents. Thank you for giving us this great interview! Homeschooling in the Digital Age ~ Quarks and Quirks Is computer use an issue at your house? What exciting and challenging times we live in! There are so many and varied opportunities for learning and sharing online. Thank you for sharing your home schooling days with us. It is great to see you are looking forward to the teenage years with such a great positive attitude and are already laying such a great foundation! I don’t have any home schoolers, teenage or otherwise, left at home any more but I do like the sound of an assistant and unlimited funds and a warm vacation place! You will survive! They will survive! It will be fine! Breathe in….breathe out…. The Spark That Changed Everything: Homeschooling a Gifted Teen ~ Crushing Tall Poppies The long, slow process of regaining a gifted teenager’s love for learning. It is so good to see that spark, Celi! Wishing you both all the very best as you continue to keep the spark burning and watch it glow brightly! The Terrible Truth About Homeschooling Teenagers ~ Defying Gravity It hasn’t been as hard as the young years! A lovely post, Ingrid – thank you! Unschooling Tweens… Let the Confusion Begin! ~ A Voracious Mind The unique journey of raising a profoundly gifted tween who has the mind of a brilliant adult trapped in a young child’s body with the emotional regulation of a teenager and the separation anxiety of a preschooler is not for the faint of heart. Gifted asynchrony personified! Many ages all at once and just when you think you have them worked out – they flip it and change it all. Thanks for a great post, Amy! Who’s afraid of the terrible teens? ~ Sprite’s Site In which Retweet is scared silly by the thought that her precious tweetlets might turn into strange, objectionable, irresponsible creatures when they become teenagers. Please visit this month’s Blog Hop contributors and leave a comment. Be part of the conversation! Visitors to Sprite’s Site who have come because of the Best Australian Blogs 2014 competition are also invited to enjoy the blog hop. Who’s afraid of the terrible teens? 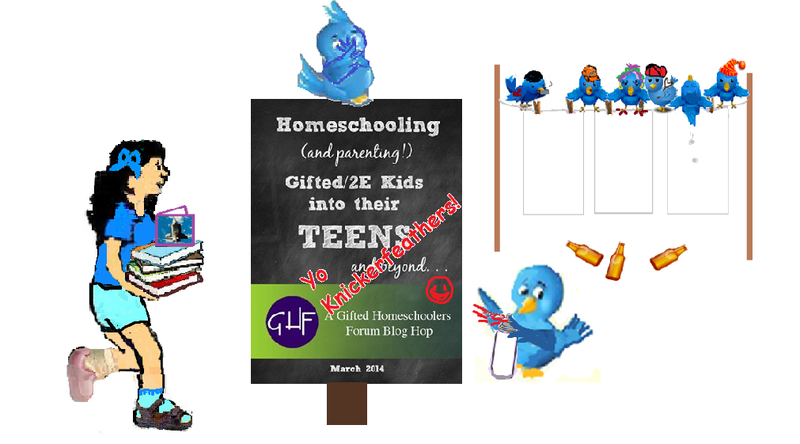 Retweet, the Twitter Bird, insisted that Sprite and I should take her along for the Second Gifted Homeschoolers Forum Blog Hop for 2014 which deals with Homeschooling (and parenting) Gifted/2E kids into their TEENS and beyond. I pointed out to Retweet that the sort of behaviour and attitudes that cause her so much worry are not only seen in teenagers and reminded her of Trending’s tweetlets who are the same age as her own tweetlets. And, as attitudes and behaviour tend to reflect those shown at home and those of the friends they are associating with, it is more likely that her NEST Ed schooled tweetlets will associate with friends who have similar values and show more of the attitudes that she would like to see. I told her that our children were teenagers (or nearly teenagers) when we were home schooling. One thing I did notice was that when they were going through teenage growth spurts all their energy seemed to go into the growing and they did not apply themselves to their work with as much enthusiasm as I would have liked! Certainly mood swings and concerns relating to body image were more apparent than when they were younger. And they were becoming increasingly independent and their desire to debate issues increased dramatically! I think I probably sugar coated it a bit for Retweet. It is now many years since we were home schooling and I tend to remember the time through a happy, rose coloured haze. I know it was not all sweetness and light every day; but the memories have had their sharp edges sanded away. The Origami Secretary Bird brought the news and the button to display on the blog sidebar. Sprite was sitting in the garden listening as Columbus Cheetah and Intellectual Dabrowski discussed her school progress so far this year and what should be done to help her along Gagne’s DMGT road leading from natural ability to fully developed talent. Intellectual Dabrowski was adamant that Sprite needed more testing to determine the best course of action for this year and that as the first term is almost over it should be done soon. Sprite has participated in the Best Australian Blogs competition for the last three years. Sensual Dabrowski scratched his head and expressed the opinion that there would not be enough time to stage special events for the Best Australian Blogs competition. 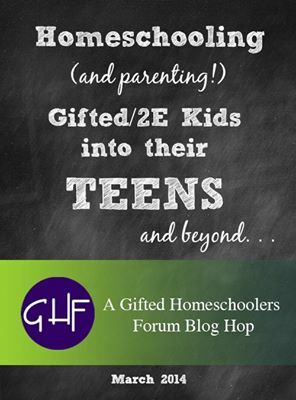 Not only did Sprite have specialist appointments to attend but she had also committed them to going on the next Gifted Homeschoolers Forum blog hop. Imaginational Dabrowski suggested a solution. “The Voting Button will arrive soon but before then Sprite needs to create campaign posters, pose for a portrait and spruce up the blog” said the Origami Secretary Bird.